No matter what you drive or where it’s from, Mike’s Foreign Car Service has got you covered. We service every make and model, old or new! We are passionate about fixing cars and aim to give you the peace of mind you are looking for when having your vehicle serviced by a professional technician. We have the tools and knowledge to service you vehicle and we are able to quickly diagnose any issue you may be experiencing when it comes to driving your car, truck or SUV. So if you are need of an oil change, brake check or a more involved repair, give us a call and we’ll be happy to answer any questions you may have! Below is a list of some of our more popular services. We are also student friendly and are proud to serve students that attend these institutions: Ohio State University, Columbus State Community College, Columbus College of Art and Design, Capital University, Ohio Dominican University, Franklin University, Mount Carmel College of Nursing, DeVry University. 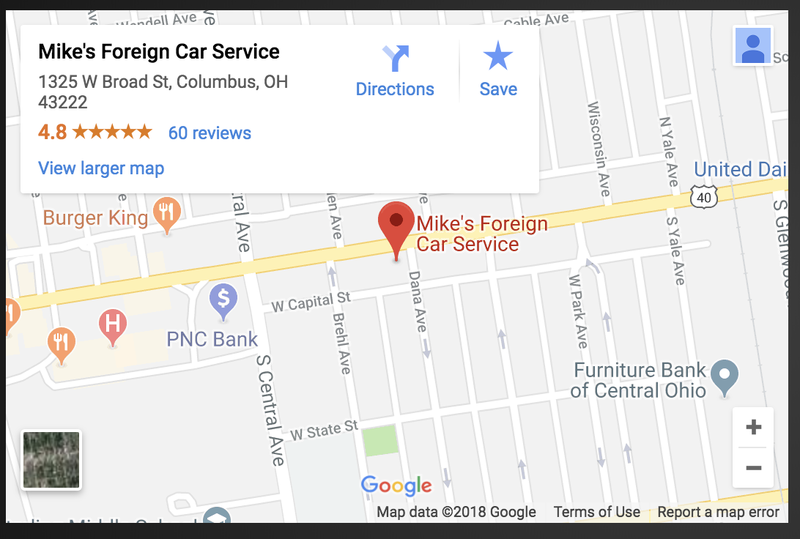 Our customer’s come from all over for maintenance and repair services, if you are in any of the following areas, be sure to consider Mike’s Foreign Car Service for all your automotive needs.